If you are looking for a way to personalize your wedding, consider making your own cake, or a cupcake tower. It is not as daunting as you might think if you make the cake and then decorate it with professionally made sugar flowers. Sugar flowers are sweet and stylish and add an amazing look to a wedding cake. The price point for the flowers depends on their intricacy. Really large ones that make an incredible statement as a single piece on a large cake are priced around $100. Small decorations for cupcakes are usually $1. Thinking of giving it a try? Test your baking skills with Sugar Flower Cake Shops Owner, Amy DeGiulio’s favorite cupcake recipe. Place all ingredients except for the milk into the bowl of a food processor. Combine until smooth. Pulse while adding the milk gradually. Fill 24 cupcake baking cups with batter. It may seem that there isn’t enough batter, but keep scraping (use a rubber spatula for the best results)! Bake for 15-20 minutes. Cover with your favorite icing! (1) Always start with room temperature ingredients, specifically the butter. (2) If you can’t find or don’t have self-rising cake flour, mix up a batch: a quick ratio is 1/4 tsp of baking powder and a pinch of salt per cup of flour. (3) Try to source ingredients locally, especially the eggs and milk. You will be amazed at the difference in the quality of your results! 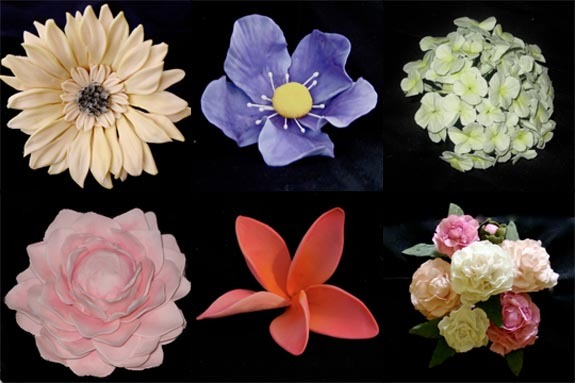 If you want to see more of these beautiful sugar flowers, check out Sugar Flower Cake Shops’ gallery. You won’t believe how pretty sugar flowers can be! All photos courtesy of Sugar Flower Cake Shop. Sugar flowers are a great way to create the cake on your own and save a lot of money in this difficult economy. Most large bake shops buy their sugar flowers pre-made anyways to save time and money. Only the Cake Boss and Ace of Cakes make them in house and that prolly only because they are on TV! Great recipe BTW!